21 May 2012 in book review buffer fantasy young adult books ~ read. Take The Godfather, mix in a little bit of The Sting, and add some magic, and you have a recipe for a great series. That alone would be enough, but Holly Black didn’t stop there. The Curse Workers is also a great character driven story, a tightly plotted page turner, and one of the most original fantasies I’ve read in a long time. When you read as much fantasy as I do, sometimes it starts to run together. Not so with the Curse Workers series; it’s unique and memorable. Cassel Sharpe comes from a crime family, but with a difference: in this mafia, people have the ability to curse other people with their hands. Curses are like a very specific, very limited magic. Curse workers might be able to cause luck, alter memories, break (or heal) bones, or, in rare cases, kill. Much of the tension in the first book, White Cat, comes from the fact that while Cassel comes from a talented curse worker family, he himself has no curse abilities. If you haven’t read this series, I urge you to stop here and read White Cat, and the second book, Red Glove. 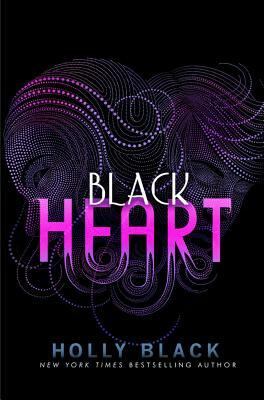 You could probably read Black Heart without having read those, but you’ll appreciate it much more for having read the whole series. The rest of this review may contain spoilers for the first two books. There’s a reason why there are so many examples of cons in literature and television and movies. There’s something fascinating about confidence men. They’re smart, charismatic and they have a freedom from the constraints of society that we envy, if we can admit it. But Cassel is not free. He is trapped by the expectations of everyone in his life: his family, the Feds, Zacharov, the Dean of the school, Lila, and even his friends Daneca and Sam. Everyone has expectations, and everyone wants something from him, and there’s no way that Cassel can live up to those expectations. Cassel is such a great character. In spite of his background, or maybe because of it, Cassel tries so hard to be good, but with all these conflicting expectations, how can he possibly figure out what’s right? But he is smart and he is charismatic, and you can’t help but cheer for him as he navigates the shark-infested waters of his life. One of the best things about this series is that there are no clear divisions between good and evil. It’s hard to even tell who are the good guys and who are the bad guys. Instead, we have complex characters who have conflicting interests and make choices and take action based on those interests. Is it any wonder that Cassel has trouble figuring out the right thing to do? If you enjoyed the first two books in this series, you won’t be disappointed in this one. It’s a great story that builds to a surprise (at least to me) climax. I think Holly Black has some talent as a con artist, because even after reading all three books, I didn’t see the climax coming, and afterwards it was so obvious I don’t know how I didn’t anticipate it. My only problem was one of the subplots that seemed a little too tangential and didn’t seem to fit in very well with the main plot. I’m not sure what purpose it served, but it’s possible it was a distraction or a red herring. FTC required disclosure: Reviewed from purchased copy. The bookstore links above are affiliate links, and I earn a very small percentage of any sales made through the links. Neither of these things influenced my review.